Happy Birthday to ME! Nope….today is not my birthday. yes you DO still have time to send me that birthday money! 😉 But it is my birthday week. Hubby always takes the week off for my birthday and we take a road trip. This year we decided to do something a wee bit different. We are getting new floors put down. I am a prisoner feeling a bit claustrophobic this morning, trapped in my room with towels stuffed underneath the closed-door. The dust is flying from grinder. It will be all good when it’s done though. I keep saying to myself. 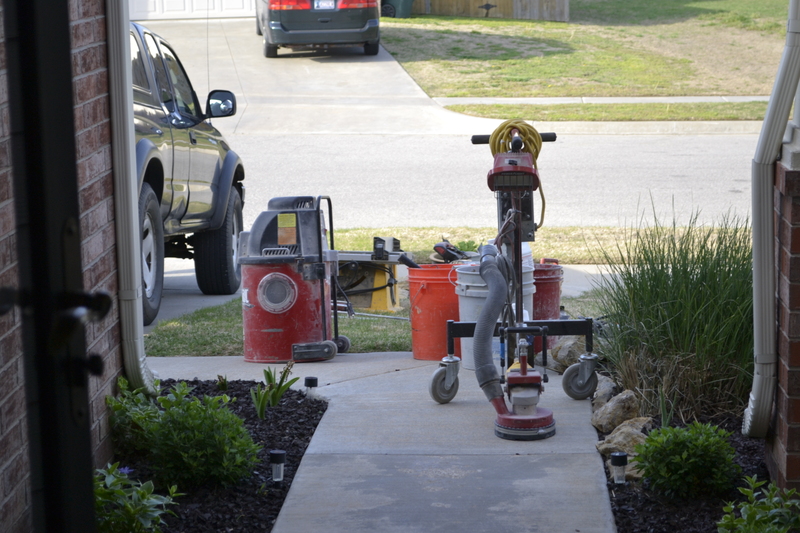 And as soon as it warms up outside….I’ll be off to work in the yard! Have a good week my friends. I’ll check in tomorrow! 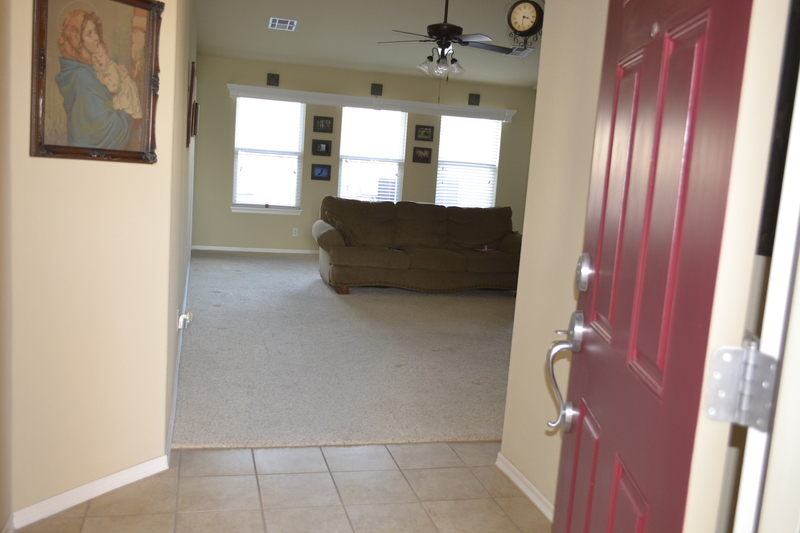 This entry was posted in Ramblings, random photos, Uncategorized and tagged Birthday, new floors, vacation, What a Mess. Bookmark the permalink. We did our whole house like that while we lived in it. I feel for you. As soon as it warms up outside…hahahaha! I’m beginning to believe winter will NEVER END! Only kidding, I bought okra seedlings as a sign of hope. They’re still inside 😦 Also, it’s best to stay away from tile floor installation. I’ve installed tile floors once. ONCE. I’ll never do it again. We have two guys here doing it for us….we thought it would be better on our marriage this way 😉 It is a big ole mess! Happy birthday, Paula! What a sweet tradition. Ooh what fun! I don’t envy the dusting mess you will have to clean up. That dust gets into EVERYTHING! The last time Clint did a tiny bit of grinding (and we put up plastic drops to contain the area), I had to wash all my dishes. With a big job, it will get into your closets! I hope they are able to keep in contained and that you will soon be posting a brand new floor! What kind are you getting? I will miss your trip photos this week; but maybe you can do a progression of your floor montage. Their grinder has a vacuum on it….pretty cool…but still a mess. Part of this “gift” includes a cleaning crew at the end. What a blessing! Shaw laminants are what we are going with. I always think about Clint when I think about floors. Mr. Tile. Man. Wow, your Man thought of EVERYTHING! He is going to deserve a batch of cookies or something. Yeah Clint says he still cringes every time he sees someone on their knees. He spent over 30 years there and he still hurts from it! We will need a vacation from our vacation! Anxious for everything to be back in place….but now I am rearranging everything. I do love the floors! The guys did an amazing job. Clint is a craftsman deluxe….but I’m sure he does not miss it. He helps me with my projects from time to time when he starts getting nostalgic. Happy Birthday week!! New floors is a wonderful birthday present to yourself, especially if someone else is doing it :). Thank you….and yes…..you are so right! Happy birthday Paula!! I love the idea of new floors for a birthday gift:) What kind of floor is going down after the grinding? Maybe we’ll get an “after” photo:) Have fun in the garden and the rest of the week!! We are going with Shaw laminants. Excited to see the completed job. Thanks for the HB! We will have a fun week doing this and that! Hope your week RoCkS! That is so exciting, Jeannette! What color is the dress? You must be the most popular/loved Nana ever! What a nice birthday present. You have to suffer a bit for it but think how wonderful it will be when it’s all finished. 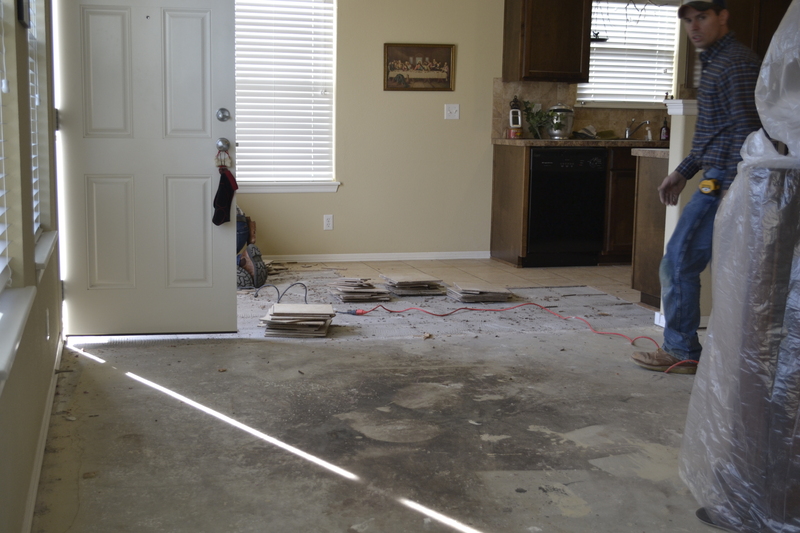 I went through this dust and inconvenience when we had our floors redone but it was so worth it! Happy birthday, Paula. Happy Birthday Week! I’m all for that way to celebrate and am doing the same the following week. Reminds me of when we took our first week of our honeymoon to strip floors and paint our first apartment in Brooklyn…. One of my pups is stressed by change too. My little remodel stretched out to three weeks. By the time it was over she was fine with walking over tools and cords – it was her new normal. Home that cleaning crew gets there soon! Happy Birthday …. I don’t want to be in your house or shoes at the moment. I hope it will be fixed soon and whenever you decide to come down .. I will be here. 😉 I am in hiding again this morning. Tonight I will dance on new floors! Your picture…the one that has the Madonna and Child…yes that one – I have it in my bedroom! My Mom does Bunka (Japanese needlework)! How freaky to see it in one of your posts! You are kidding?!?! Most people do not realize it is needlework even in person! Hubby bought that for me when I was pregnant with our oldest son (who is now 27)….so it’s been around a very long while. Too cool. Way cool. Love it. Happy birthday. Hope everything turns out just the way you want. 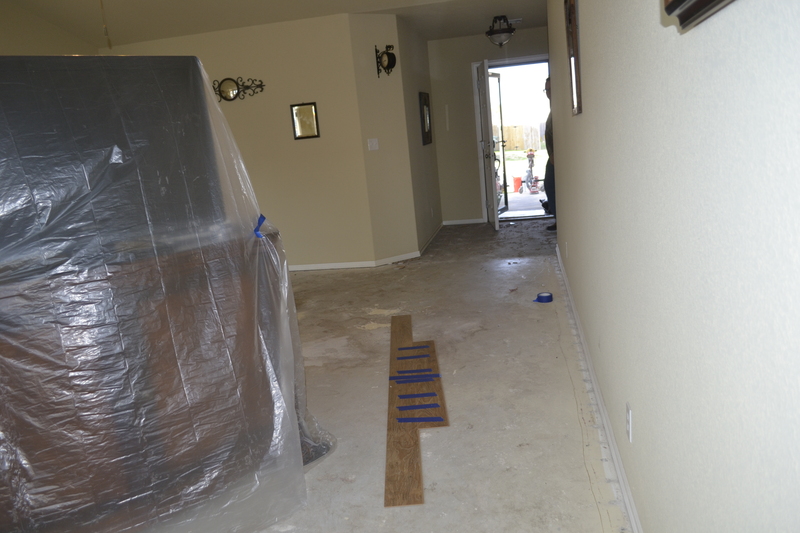 We laid flooring down in our OK house too… yeaahh… that was fun LOL But it was WORTH IT! !